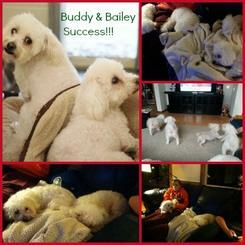 Buddy and Bailey, our father and son poodle team, relax with their new family here. You can see they’re fitting in well with the rest of the gang. Both boys have been to visit several times. They look great and are doing well.